The Tanzania Zambia Railway Authority (TAZARA) has recently received four new mainline locomotives and eighteen passenger wagons worth USD 22.4 million from China South Locomotive & Rolling Stock Corporation QISHUYAN Company Limited (CSR). The equipment received is meant to raise the locomotive reliability between failures by 18% boosting the daily availability from 12 to 16 locomotives and extending their functionality from the current 6,015 km to 7,098 km over the 1,860 km railway connecting Dar es Salaam’s port with Kapiri-Mposhi in Zambia’s central region. The new locomotives and wagons were acquired thanks to an interest-free loan awarded by the Chinese Government under the 15th Protocol of Economic and Technical Cooperation (15th Protocol) signed by Tanzania, China and Zambia in 2012 to improve the Tanzania Zambia railway’s infrastructure with CNY 270 million – USD 40 million – worth of projects. TAZARA is thankful with the Chinese Government for the constant support and association with the authority which started 40 years ago with the construction of the railway and that so far has invested CNY 2,500 million – USD 370 million – on railway’s improvements, explained TAZARA Acting Managing Director Ronald Phiri. Under the 15th Protocol, the committed fund has been almost completed with this last delivery of 4 locomotives and 18 wagons which are within the 12 projects engaged including 2 shutting locomotives, 2 rescue cranes, lifting equipment, track trolleys, spare parts, 30,000 wooden sleepers, training of TAZARA staff, and appointment of Chinese railway experts to Tanzania for a pre-established time. The last delivery follows the visit of a Chinese team constituted by six experts on International Relations and Global Development from the Shanghai Institute for International Studies (SIIS) whom undertook an experimental test-ride over 20 km of the railway in October, 2015. China has so far awarded Tanzania with interest-free and concessional loans and grants worth of USD 108,293 million, CNY 619 million and TZS 438 million in different sectors according to China Foreign Aid. TAZARA is the entity in charge of operating the Tanzania-Zambia railway since its inception in 1975 by a bilateral agreement signed between both countries under the TAZARA Act 1975 which established the power and functions of the authority, as the holding of shares equally distributed between Tanzania and Zambia as well. 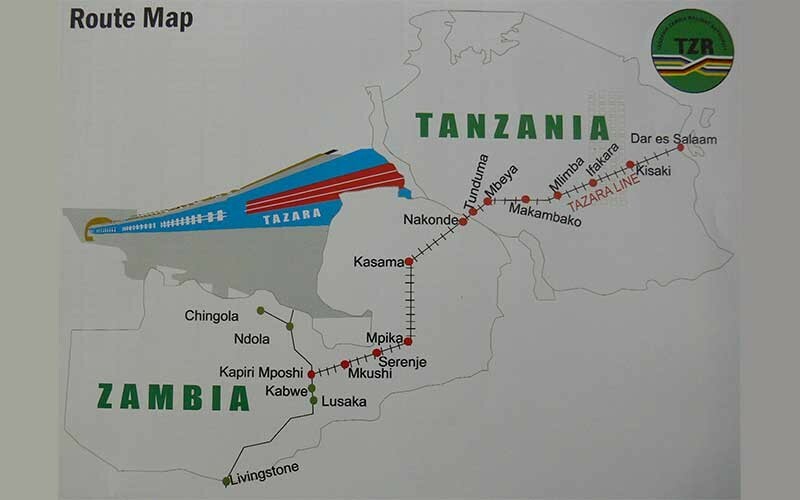 TAZARA faced a funding challenge where it planned to start with the railway’s construction works due to western countries and development partners that rejected the award of funds since they categorized the project as non-viable. However, the Chinese Government realized that the railway would play an important rule thinking about its foreign trade plans for the future and decided not only to fund the project, but also to give technical support, expertise, equipment, and related infrastructure to make it viable. TAZARA aims at becoming the most preferred passenger and cargo transport organization in the Sub Saharan region by providing efficient and quality transport services, reason why it is not only improving the railway’s infrastructure with support under the 15th Protocol but also under agreements with private companies as the Memorandum of Understanding (MoU) signed with Dutch Trafigura Beheer BV in 2014 to modernize locomotives and raise the copper transport capacity to Dar es Salaam’s port.